It was my first trip with my husband to Tbilisi, Georgia. 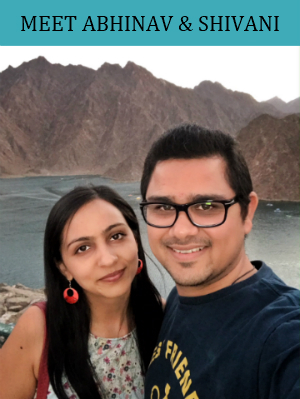 On 5th July 2016, we flew from Dubai to Tbilisi, Georgia. No wonder that tourism in Georgia is growing at a very fast pace with so many places to visit there. If you are planning a trip to Georgia, it will absolutely blow your mind with its extraordinary beauty. My first visit to Tbilisi with my husband was a remarkable experience, that I will never forget. After being quite confused about planning this trip, we finally booked our air tickets and made hotel reservations for the 2nd week of July 2016. With a stay at Orion Old Town Hotel in Tbilisi, we found that the hotel is located in the center of Tbilisi. It is only a 2-minute walk from Avlabari Metro Station, and the hotel offers a lounge area & free WiFi also. Hurray! Can't get better than this. FIRST DAY of our trip started with the cable car ride at Tbilisi. This cable car connects Rike Park on the left bank of the Mtkvari river with Narikala Fortress. For only 1 Lari, we enjoyed the fantastic 360-degree view of the city from the large windows of the car and had an easy ride to the top of the hill. 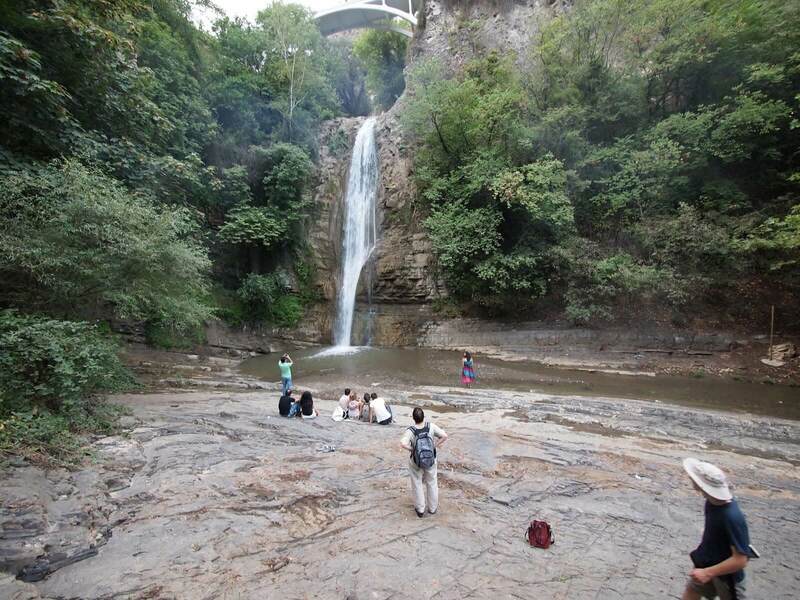 Three of Tbilisi’s visitor attractions are just a short walk away now. We started by visiting the Kartis Deda's statue. 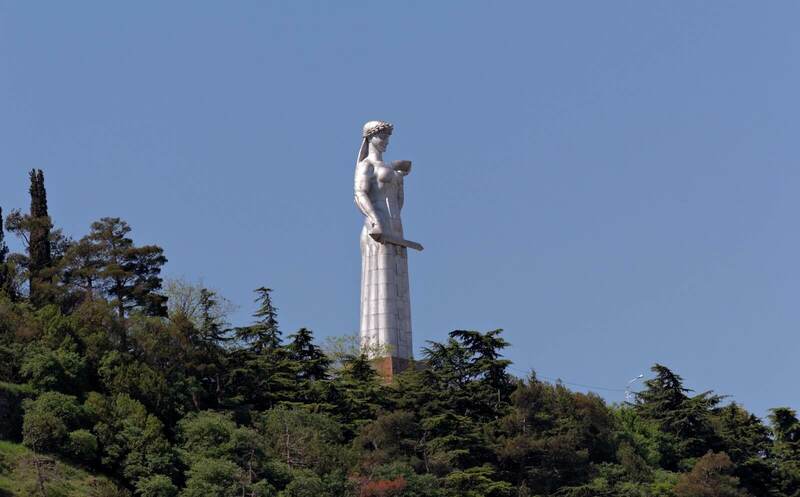 The statue of "Kartlis Deda" commonly known as "Mother of Georgia" symbolizes the Georgian national character. On one hand, she carries a bowl of wine, to show hospitality, and on the other, a sword that represents every Georgians love of freedom. After taking a few photos of the statue of Mother of Georgia, we headed to the Narikala Fortress and Saint Nicholas Church. Some of the steps that lead to the top of the walls were steep and narrow and partly damaged. We climbed the wall very carefully. It was easy to wander for a couple of hours in these tree-filled and waterfall-dotted gardens, which stretch more than a kilometer up the valley beneath the cliffs of Narikala Fortress. We spent a quality time there. We ended up searching for vegetarian food in a lot of nearby restaurants and finally got some vegetable salad, vegetable rice, and Georgian bread. However, no food was worth eating except the vegetable rice that was just OK. So basically, we ended up feeling hungry without really feeling satisfied with the food. NOTE: If you intend to fully explore this sightseeing in old Tbilisi, be ready for a long walk. Sensible shoes are recommended. We were planning to reach the Gergeti Trinity Church on the top of the mountain. The driver stopped at different sights which were really worth it especially Fortress Ananuri. (It is located along the Georgian Military Highway on the foreland by the Aragvi River, not far from Zhinvali water reservoir.) Within the complex were two churches. The older Church of the Virgin and the larger Church of the Assumption. The Assumption Church was covered with wonderful stone carving, including a large cross on every wall. The views of the reservoir and surrounding mountains were spectacular and well worth a visit. We then stopped at a restaurant for lunch where we again found only 2-3 vegetarian food items. However, we never heard those food names earlier (except french fries), but still, we ordered the food Khinkali and Khachapuri. Khachapuri is basically a cheese-stuffed bread, stuffed either with meat and spices or boiled potatoes or cheese. We ordered Khinkali stuffed with boiled potatoes that were tasteless. But French Fries and Khachapuri were delicious. We then resumed our journey to Kazbegi and continued capturing fine countryside views on camera. Finally, we reached Kazbegi by the evening where we had already booked a guest house named as Redstone Guest House, in Stepantsminda (a village in Kazbegi). We spent our rest of the day in the guest house talking endlessly and enjoying the weather sitting on the balcony. The best part of the guest house was that a large window of our room was facing the mountains (especially Mount Kazbek). THE THIRD DAY, we woke up early in the morning when the view outside our window was unbelievably spectacular and the mountains were gorgeous, surrounded by clouds. The views over mountain range were breathtaking. 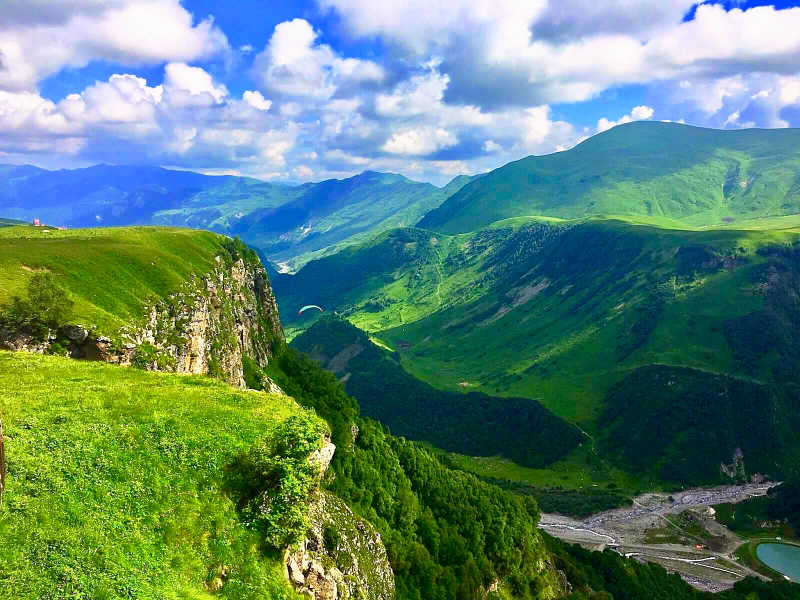 We hired a jeep from Kazbegi square and it's worth the breathtaking jeep ride up and down the mountain. The church was marvelous and beautiful inside & out. It was an amazing mountain view out there. The mountains around were bright green. We stayed up there for as long as we could, just taking it all in, before riding back down to Kazbegi. We took wonderful pictures of the church and the view outside. When the sun went down, we ended up back to the Kazbegi square. We started looking for a restaurant as we were hungry and found a restaurant on a terrace with a beautiful view. The name of the restaurant was Cafe 5047m. It was a nice cold evening and we took a table on the terrace to enjoy that cozy place with the view of mountains. The service was friendly and even they offered two blankets and as a bonus, they had blankets for guests after sunset as it became cold. We ordered two coffee and it was the best coffee we had in our whole Georgia trip. The fried potatoes and vegetable rice were also good. After having dinner, we took the taxi back to our guest house in Stepantsminda. Next morning, on our FOURTH DAY, we cooked our breakfast in the guest house and left for Tbilisi. We checked-in to the same Orion Old Town hotel, took some rest and then left to explore the city (Tbilisi). We went to visit the Holy Trinity Cathedral commonly known as Sameba. (It is one of the largest Orthodox churches in the world.) And our hotel was near to this church by chance. So, we couldn't miss visiting this main church in town. The beauty of the cathedral was indeed breathtaking, rising magnificently on the hill. The building was magnificent. The huge land surrounding the church and it also had a good view of the city. We enjoyed the vastness of the interior and peaceful surrounding. The architecture really amused us. Sameba is the highest church in Georgia. Its golden dome is practically seen from any point in Tbilisi. It is one of the main sights of Tbilisi. After enjoying our visit to the cathedral and taking few amazing photo snaps, we booked a taxi for Mtatsminda Park. Located 800-meters above the city on the top of Mtatsminda Mountain, Mtatsminda Park spreads over more than 1 sq. km and has been a popular fun spot for generations. We purchased the card for rides and amusements and entered the park. There were numerous, reasonably priced outdoor cafes and beautiful gardens with lots of tall trees. The Park has spectacular views of the city. After roaming the park, we had a ride on the big Ferris Wheel. This 80 meter Ferris wheel perched on the edge of the hill providing one of the best views over Tbilisi. We spent our whole day in the park enjoying the rides and attractions of the park. And while heading back to our hotel at night, we got to know that the Park can also be reached by the iconic funicular railway. (The shortest & best way to go from the center of Tbilisi to Mtatsminda Park is the funicular). So, we planned to take the Funicular to Mtatsminda Park for the next day. 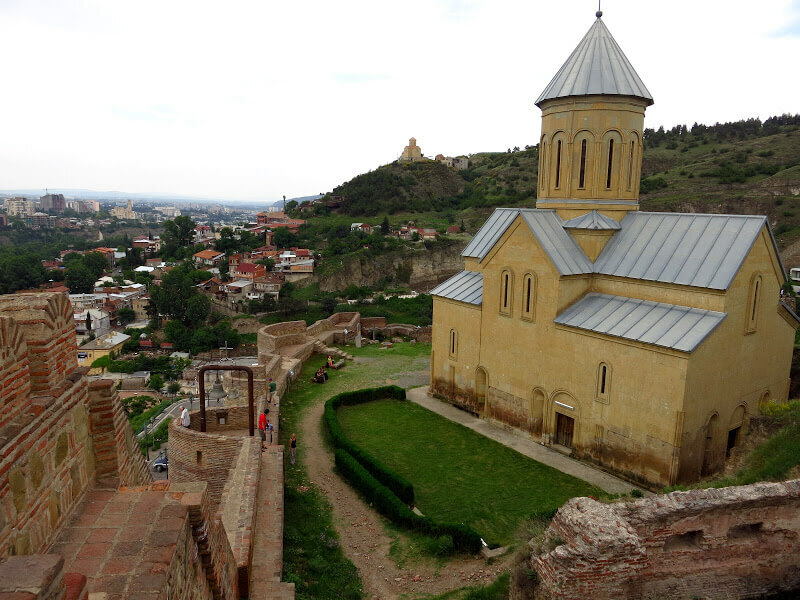 On the LAST DAY of our vacation, we explored the old town Tbilisi. We had visited the local places in the old town like Dinamo Arena, Vake Park, Rustaveli Avenue, Opera House and bought some souvenirs from the old town streets. In the evening, we again went to the Mtatsminda Park, but this time by Funicular. It was also an experience in itself. (It's one of the longest and steepest funiculars in the world.). After taking a trip on the iconic funicular railway, we spent some time in the Mtatsminda Park enjoying the spectacular panoramic views of Tbilisi. And the same night, we headed back from Tbilisi to Dubai with lots of beautiful and adventurous memories. What's your favorite travel memory? Please let us know and leave a comment in the section below. We would love to hear about your travel experiences!